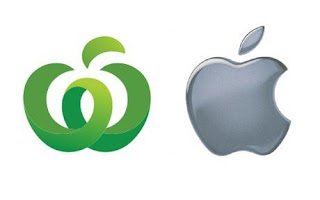 Apple has attacked the validity of Woolworth's trade mark application in Australia arguing that their green stylized W-shaped apple is too similar to Apple's own corporate logo. In 2008 Australia's largest supermarket chain rebranded its services, introducing the new green apple aimed at emphasizing Woolworth's commitment to fresh produce. It is not Woolworth's use of this trade mark on general produce that concerns Apple. Given Woolworth's blanket trade mark application, Apple is allegedly concerned that Woolworths, in competition with Apple's iProducts, will place the trade mark on its own-brand electronic equipment. As reported by the Sydney Morning Herald, Apple's complaint, lodged with IP Australia (the supervising intellectual property body), contended that Woolworths trade mark should be rejected on the grounds that consumers would be confused between the two brands. As reported by the Telegraph, a spokesperson for Woolworths stated that the green 'W' is meant to represent freshness of produce rather than specifically representing an apple. If it looks like an apple, smells like an apple, and by all accounts is an apple, this IPKat isn't sure how one gets to state it only depicts 'freshness'. This arguement is especially tenuous if one then decides to affix the 'fresh' logo on to electronics, something that Woolworths has apparently not ruled out. and click the "Enter as Guest" link. From there, enter 1258297 in the "TM Number List" box at the bottom. Who should be the next EPO president? Are YOU a junior IP practitioner? Curia replies to Sir Kat -- and it's good news! Copying without Infringing: a competition! The UK-IPO: trendy but pointless? It's faster by CTM -- but should it be?